To control black spot, rust, white powdery mildew and downey mildew on all varieties of roses, use our environmentally safe and chemical-free Garlic GP Rose*. 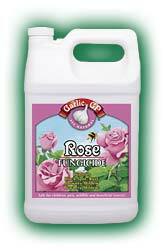 Economical to use, Garlic GP Rose becomes odorless in hours, and is safe for children, pets, birds, wildlife and beneficial insects. Plus, just one application last up to 21 days. Safe for use on all varieties of roses. My roses were being overrun with aphids. A friend sent me some Garlic GP Rose Fungicide. After 2 applications, the aphids were gone.Now I spray my roses once a week and they are aphid free. Adios Aphids.